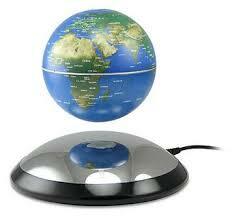 Place it to your office, home or classroom, the magnetic floating globe will amaze your guests and friends. A great item for decoration, party supply item or a gift for friend. Meet the Levitation Anti-Gravity Globe, Suspended in mid-air, this 4" globe defies gravity & rotates - inspiring wonder and amazement. Included mirror base creates amazing effect. This technology heralds a breakthrough in the art of magnetic levitation. Observe Earth levitate in space - only touching air! Developed by an international engineering team, this stylish, electromagnetic base uses minimal power to effect REAL LEVITATION. The anti-gravity globe is the ultimate conversation piece. Musuem quality and design with a futuristic effect makes this a must have for the home or office. This item makes the perfect corporate gift or executive gift. Included with each globe is a mirror base and a power supply. 12 V power supply (120 - 240 V AC adapter included).